Retired teacher who sees much harm to public education from the "reforms" being pushed by corporations. Privatizing education is the wrong way to go. Children can not be treated as products, thought of in terms of profit and loss. 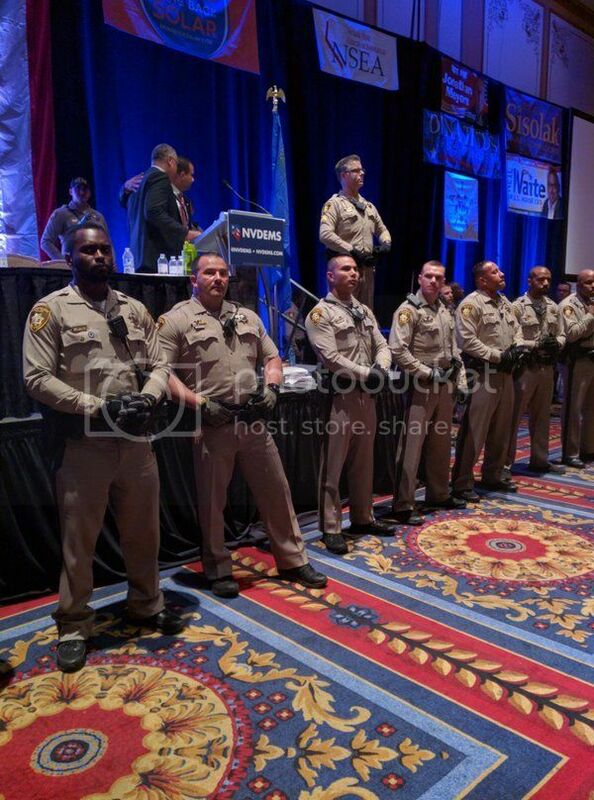 This is what Democracy looked like in Nevada tonight. Tim Canova says denied access to DNC voter database for running against DWS, an incumbent. Has this always been a policy at the DNC that if you run against an opponent you can't access the party's voter database? I never realized this before. Tim Canova is challenging Debbie Wasserman Schultz in FL 23rd CD. This is part of an email from him today. I was told that our campaign would be denied access to this database because I am running against an incumbent Democrat, Debbie Wasserman Schultz. I was also told that any Democratic candidate running against an incumbent Democrat would be denied access — even a lifelong progressive challenging an out-of-touch incumbent. This is unfair and undemocratic. My opponent already has untold advantages against an insurgent progressive campaign like ours. We are refusing to take corporate money, while she has taken millions of dollars from Wall Street bankers, payday lenders, private prison companies, and other corporate special interests. How much more of an advantage does Wasserman Schultz need to silence the voices of grassroots voters in our district? This is nothing less than an entrenched establishment throwing up roadblocks against our political revolution. We’ve seen my opponent do this against Bernie’s presidential campaign and other progressive challengers. As head of the DNC, Wasserman Schultz has pushed strategies that suppress voter turnout, all to protect incumbents and establishment politicians. She has routinely defended the party’s use of Superdelegates to block the will of Democratic voters in state after state. All of this has made our party weaker and more vulnerable against Republicans in general elections, which is so painfully obvious with the Democratic Party’s losses in the midterm elections in the past six years — 13 Senate seats and 69 House seats, the biggest loss of congressional Democrats in modern political history. FL paper has 3 page article about Hillary and her GOP opponents. Bernie not mentioned. This is pretty typical, so not surprised. But 3 pages not mentioning Bernie Sanders at all? That's kind of hard to do. The only one that Clinton can thump: front-running Republican Donald Trump. Clinton beats Trump 39 percent to 30 percent. Those are the results of a statewide Ledger/10 News WTSP poll conducted March 7 through 9 by Mason-Dixon Polling & Research of Jacksonville and released Friday. A total of 625 registered voters were interviewed for the poll. The answer why Clinton tops Trump in the poll is simple, said Susan McManus, a political science professor at the University of South Florida. “A lot of people don't like Donald Trump,” she said. McManus is considered the dean of political scientists in Florida. She is now teaching a class focused on learning about public opinion surveys. Quite frankly I find this to be insulting toward a large group of people who are Bernie supporters. Even the right wing leaning pundits like McManus only mention Hillary. It is though Bernie Sanders doesn't exist in the world of Florida media. Bernie wins Democrats abroad primary 70% to 30%, bigger margin than Obama. Democrats abroad are “FeelingTheBern” strongly (nearly) everywhere: Bernie Sanders has won an overwhelming victory in the Democrats abroad primaries conducted in the week from March 1 to March 8. While it will take another week (March 21st) until official results will be released, it seems that Bernie has won an astonishing 70 percent of Democrats’ abroad votes, winning the primaries in every country (with the lone exception of Singapore), exceeding Obama’s 2008 — then big — margin of victory by another 8 points. Therefore It seems highly likely that Bernie Sanders will win 9 out of 13 pledged delegates, ensuring a 9 to 4 delegate split over Mrs. Clinton, thereby closing the overall delegate gap by 5 delegates. 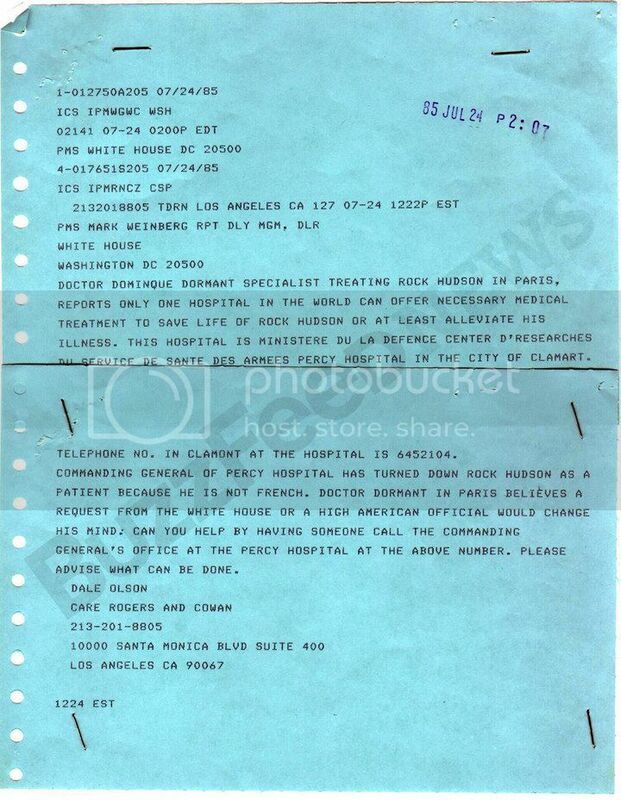 1985 Rock Hudson's telegraph to Reagans pleading for help. The answer was no. Although only a handful of people knew it, Hudson was in Paris desperately seeking treatment for AIDS — treatment that even a prominent, wealthy actor could not get in the United States in 1985. Although more than 5,500 people had died from the disease by the start of 1985, the government had taken few significant steps toward addressing the disease — with the Reagan administration recommending a $10 million cut in AIDS spending down to $86 million in its federal budget proposal released in February 1985. And so, Hudson traveled to France, hoping to see Dr. Dominique Dormant, a French army doctor who had secretly treated him for AIDS the past fall. Dormant, though, was unable to get the actor transferred to the military hospital. Initially, the doctor wasn’t even able to get permission to see Hudson at the American Hospital. First Lady Nancy Reagan turned down the request. Speaking of Reagan and AIDS, a story of public ridicule and pandering to religious right. This from The Forward in 2003. It's a tragic story of a president who would laugh at the crude jokes of Bob Hope while Mitterand and wife sat appalled. As we read about and discuss the history of the American AIDS epidemic in class, my students — all Reagan babies, born between 1981 and 1985 — are often dumbfounded when faced with simple facts. Although AIDS was first reported in the medical and popular press in 1981, it was only in October 1987 that Reagan publicly spoke about the epidemic. By the end of that year 59,572 AIDS cases had been reported and 27,909 of those women and men had died. How could this happen, they ask? Didn’t he see that this was an ever-expanding epidemic? How could he not say anything? Do anything? But the public scandal over the Reagan administration’s reaction to AIDS is complex and goes much deeper, far beyond the commander in chief’s refusal to speak out about the epidemic. Reagan understood that a great deal of his power resided in a broad base of born-again Christian Republican conservatives who embraced a deeply reactionary social agenda of which a virulent, demonizing homophobia was a central tenet. In the media, men such as Pat Robertson and Jerry Falwell articulated these sentiments that portrayed gay people as diseased sinners and promoted the idea that AIDS was a punishment from God and that the gay rights movement had to be stopped. In the Republican Party, zealous right-wingers such as Rep. William Dannemeyer of California and Senator Jesse Helms of North Carolina hammered home this message. In the Reagan White House, people such as Secretary of Education William Bennett and Gary Bauer, Reagan’s domestic policy adviser, worked to enact it in the administration’s policies. Throughout all of this Reagan said nothing and did nothing. When Rock Hudson, a friend and colleague of the Reagans, was diagnosed with AIDS and died in 1985 (one of the 20,740 cases reported that year), Reagan still did not speak out as president. When family friend William F. Buckley, in a March 18, 1986, New York Times opinion article, called for mandatory testing for HIV and said that HIV-positive gay men should have this information forcibly tattooed on their buttocks (and IV-drug users on their arms) Reagan said nothing. In 1986 (after five years of complete silence), when Surgeon General C. Everett Koop released a report calling for AIDS education in schools, Bennett and Bauer did everything possible to undercut and prevent funding for Koop’s too-little-too-late initiative. Reagan, again, said and did nothing. By the end of 1986, 37,061 AIDS cases had been reported; 16,301 people had died. ..... I told one of my students that the most memorable Reagan AIDS moment for me was at the 1986 centenary rededication of the Statue of Liberty. The Reagans were there sitting next to French President Francois Mitterand and his wife, Danielle. Bob Hope was on stage entertaining the all-star audience. In the middle of a series of one-liners Hope quipped, “I just heard that the Statue of Liberty has AIDS but she doesn’t know if she got it from the mouth of the Hudson or the Staten Island Fairy.” As the television camera panned the audience, the Mitterands looked appalled. The Reagans were laughing. By the end of 1989 and the Reagan years, 115,786 women and men had been diagnosed with AIDS in the United States, and more than 70,000 of them had died. From my view in my life in the South, I saw and heard some of this scorn. I heard preachers using words that shocked me. If anyone wonders why so many reacted strongly to Hillary's words, there are several reasons why. I am sure it forces those who lost loved ones during that time some pain to see false homage paid to such uncaring political people. And to those of us who watched and cared it reminded of a time in which fellow human beings were mocked and scorned by national leaders in our country. Video. Massive Bernie rally in Tampa. Estimated 9000. About 20,000 altogether in Florida today. The numbers listed are from the Twitter page of John Wagner of the Washington Post. I posted this in General Discussion but it needs to be seen in this video forum as well. FairVote: Facts about primary voting at 17. Where's it's allowed, and why it should be. We recently learned that the Bernie Sanders campaign filed suit against Ohio secretary of state in push to allow 17-year-olds to vote. Sanders campaign manager Jeff Weaver argued Tuesday that state law previously allowed 17-year-olds to vote in presidential primaries, accusing Jon Husted, a Republican, of trying to "disenfranchise" voters. "The secretary of state has decided to disenfranchise people who are 17 but will be 18 by the day of the general election. Those people have been allowed to vote under the law of Ohio, but the secretary of state of the state of Ohio has decided to disenfranchise those people to forbid them from voting in the primary that is coming up on March 15," Weaver told reporters in Detroit. The Columbus Dispatch reported Saturday that a state Democratic lawmaker raised the issue last week, claiming that Husted changed the interpretation of the law. Husted denied he has changed it, but FairVote disagrees with him. 7-year-olds can vote in primaries and caucuses in large number of states, including Alaska, Connecticut, Delaware, Hawaii, Illinois, Indiana, Iowa, Kentucky, Maine, Maryland, Mississippi, Nebraska, Nevada, North Carolina, Ohio*, South Carolina, Virginia, Vermont, Washington, West Virginia, and Wyoming. Seventeen-year-olds may also vote in District of Columbia primaries. Most have done this by state law, but others by changing state party rules. Parties may request allowing 17-year-old primary voting by asserting their First Amendment freedom of association rights. *Note about Ohio: Ohio law plainly allows 17-year-olds to vote in primary elections, but the Ohio Secretary of State has announced that 17-year-olds may not vote in Ohio's 2016 presidential primary. We disagree with that interpretation of Ohio law, but know that if you are 17, you may not be allowed to vote in Ohio's 2016 presidential primary. Bernie Sanders said Tuesday his campaign has filed suit against Ohio's secretary of state, seeking to allow 17-year-olds to vote in the presidential primary there. But Husted said Tuesday that there has been no change -- 17-year-olds who turn 18 by Election Day in November have always been allowed to vote in direct nominations (such as Ohio's Senate primary) but barred from voting for delegates in the presidential primary. Not sure I understand why they let them vote for some things but not for others if they are going to be 18 by November.